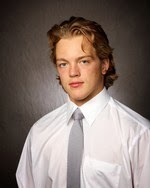 Michael Bitzer, G, Lincoln Stars: Turning 20 this Wednesday, the Moorhead, Minnesota native celebrated early by posting a 1-0-1 record with a 0.95 goals-against average and .970 save percentage in a pair of road games. He stopped a season high 37 shots, and then turned aside both shootout attempts, in a 2-1 win over Team USA on Friday for his first win of the season. On Saturday, the Bemidji State University commit made 28 saves in a 1-0 overtime loss to the Youngstown Phantoms. He has allowed two-or-fewer goals in four of seven games played this season and has posted a 1-1-4 overall record with a 2.42 GAA and .912 SV%. Great to see the league give some recognition to Michael. He was the #1 reason why the Stars earned three of four points this past weekend. Hopefully this is the first of many awards this season for him. Congrats again to Michael! Well deserved.